Here, darkness looms on the horizon. An army marches towards war. And a figure stands on the precipice of destruction. Intrigued yet? Rich. Complex. Brilliant. 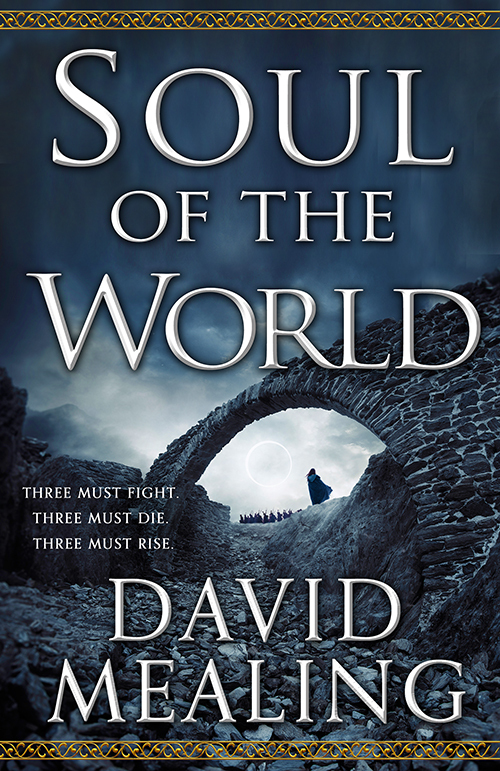 SOUL OF THE WORLD (US | UK | AUS) is a masterwork of world-building—an epic of intricate magics, world-ending battles, and matters of empire. Make sure to check out David Mealing’s breathtaking debut June 2017! Three must fight. Three must die. Three must rise. It is a time of revolution. In the cities, food shortages stir citizens to riots against the crown. In the wilds, new magic threatens the dominance of the tribes. And on the battlefields, even the most brilliant commanders struggle in the shadow of total war. Three lines of magic must be mastered in order to usher in a new age, and three heroes must emerge. Erris is a brilliant cavalry officer trying to defend New Sarresant from an enemy general armed with magic she barely understands. Arak’Jur wields the power of beasts to keep his people safe, but his strength cannot protect them from war amongst themselves. Sarine is an artist on the streets of New Sarresant whose secret familiar helps her uncover bloodlust and madness where she expected only revolutionary fervor. Each must learn the secrets of their power in time to guide their people through ruin. But a greater evil may be trying to stop them.